Praised by almost everyone who's played the freeware PC title, Cave Story is considered by many to be the pinnacle of the "Metroidvania" genre, a polished action platformer embellished with endearing characters and a catchy soundtrack. No matter how many times we're reminded of the fact, it always astounds us that the game was designed and developed by a single programmer, Daisuke Amaya, or Pixel, as he's more commonly known. As you might should know, homebrew developer Ravenworks has been working on a DS port for Cave Story. As it turns out, however, Pixel doesn't own a Nintendo DS, so it would be unlikely that he'd be able to play the port once it's completed. In fact, he hasn't owned a handheld or home console since the Nintendo 64! Isn't it a crime nowadays for gamers in Japan to not own a Nintendo DS? So, how did Pixel take to the package? You can read his reaction, as well as the community's reasons for picking those two particular games for their offering, past the post break! We also used this effort as an excuse to catch up with Ravenworks on Cave Story DS's progress. Pixel's response, as summarized by ATSP community member ufo_z: "Basically, he's very happy about the DS (his treasure! ), and he's feeling kind of strange to see Cave Story working on it so well. Also, he's loving GC:CX a lot. Apparently, it reminds him of hanging out at his friend's [while] playing on the NES as a child. So, looks like, all in all, this was a triumph!" 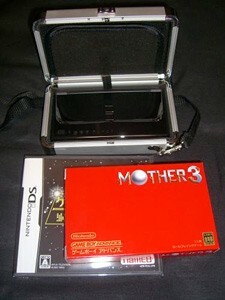 DS Fanboy: What made you decide to send those two particular games -- Mother 3 and Game Center CX? Ravenworks: I think it was Shih (Shihtzu, one of ATSP's maintainers and Cave Story's English translators) who first suggested Game Center CX. It seemed perfect since Pixel certainly seems to have a fondness for the era of video gaming that game is built around. It seemed like more of a fit than, say, something like Brain Age ... Not that Brain Age wouldn't have been good, or Phantom Hourglass, or any of the other ones tossed around, but a "retro games" game seemed more topical. (from what I can tell without being able to read the text, anyway). It turned out to be tricky to track a copy down actually, but ufo_z pulled it off in the end! Hopefully, Pixel will enjoy it. What is that case the the DS is in? The case is just a $10 case from Best Buy. It looks like metal, but it's mostly shiny plastic. It's pretty sturdy, though, which was my main concern, in case the package got jostled around. All the breakable stuff went in there, but everything else (including the DS's box) was sent along with it. How's development going with Cave Story DS? As a matter of fact, a while ago, I brought a friend of mine in on the project (with Pixel's permission) to help, because I've been so busy with work lately. But as it happens, his programmer-fu is much stronger than mine, and he wound up proving wrong my initial assumption that a straight-up port like the PSP version couldn't work well on something lightweight like the DS. So, a week after starting from scratch he had it running farther than the first several months of my half-port/half-remake version. It's now pretty much his port instead. It's actually really far along by now; he should be releasing a public demo sometime soon.